The Boeing X-32A makes its first flight. The Joint Strike Fighter (JSF) programme has been described as the largest single defence project in history, with a potential market for 5,000-8,000 aircraft and the key objective of reversing the continuing upward trend in military aircraft unit costs. The origins of JSF lie in the realisation by the US Marine Corps and Royal Navy during the 1980s that a replacement for the Sea Harrier and AV-8B would be required after the year 2000. Various research studies were undertaken on both sides of the Atlantic into advanced Short Take-Off and Vertical Landing (STOVL) concepts. The best of these concepts appeared to involve the use of a dedicated lift-fan located behind the cockpit. In 1989, DARPA (Defense Advanced Research Projects Agency) took over leadership of the advanced STOVL project and focused the on-going effort into a phased development programme leading to a flying demonstrator aircraft using the powerful new engines developed for the YF-22 and YF-23 Advanced Tactical Fighter. As the studies progressed, it was realised that a STOVL aircraft with the lift-fan removed and replaced by a large fuel tank would result in a fighter with excellent long range capability. Such a fighter would fulfil the needs of the USAF, which was looking for a longer-ranged fighter capability in the light of Gulf War operations. 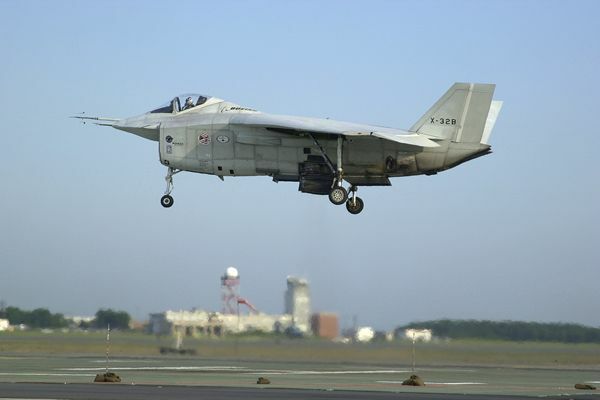 Thus was born the Common Affordable Lightweight Fighter (CALF) project – aimed at producing a single aircraft design with both STOVL and Conventional Take-Off and Landing (CTOL) variants. In March 1993, study contracts were issued to Lockheed and McDonnell Douglas under the CALF project. In addition, Boeing and Northrop Grumman initiated self-funded design studies. In 1995, CALF was absorbed into the Joint Advanced Strike Technology (JAST) programme, which was originally intended to focus on technology studies and demonstration of various equipment for next generation strike aircraft. In fact, JAST soon evolved into a firm requirement for an advanced single-seat, single-engined lightweight multi-role fighter which could be operated by the USAF, US Navy and US Marines in closely similar variants. The opportunity to replace the F-16, A-10, F/A-18C/D and AV-8B with one design would result in huge savings in costs due to the large production run. During 1996 JAST was renamed JSF (Joint Strike Fighter). In November 1996, Boeing and Lockheed Martin were awarded contracts to build two Concept Demonstrator Aircraft (CDA) – one CTOL version and one STOVL version – each. The aircraft were not intended to be fighter prototypes, but rather to prove that the selected design concepts would work, hence the use of X-series designations. The Boeing design received the designation X-32 and the Lockheed Martin design the designation X-35. 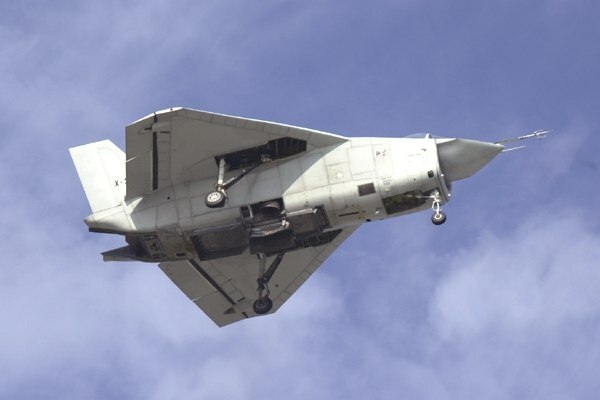 The Boeing X-32 uses a novel airframe shape combined with a direct-lift STOVL configuration. The AV-8B Harrier-style direct lift concept requires the lift nozzles to be on the centre of gravity of the aircraft. To achieve this, the engine is located in the front portion of the fuselage, with the vectoring nozzles immediately behind it, and then a long exhaust duct leading back to the afterburner and pitch-axis thrust vectoring nozzle at the rear. The engine position and overall dimension limitations dictated a very short nose. The thick delta wing was chosen to give good high-Alpha characteristics and its large volume allowed fuel tankage to give long range. 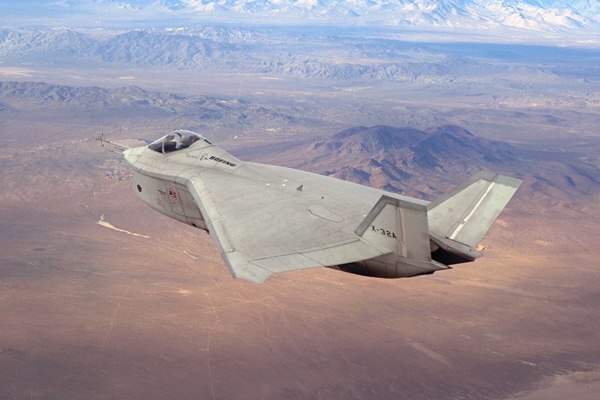 For the two CDA aircraft, the designation X-32A was allocated to the CTOL version and X-32B to the STOVL version. Unlike the Lockheed Martin X-35, there were no airframe changes required to demonstrate US Navy aircraft carrier (CV/CTOL) approach capabilities – the X-32A performed both roles. Apart from the lift nozzles on the STOVL version, there are a number of design differences between the two airframe configurations. 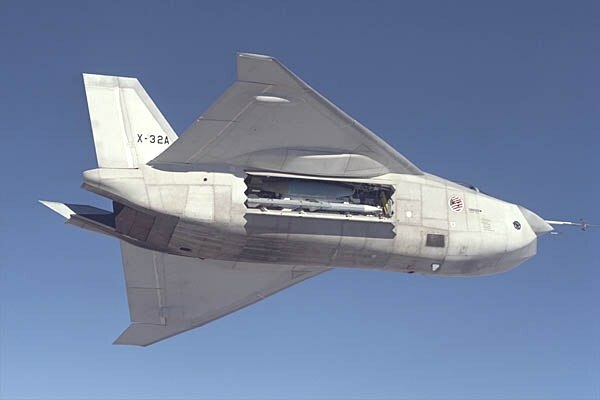 The X-32A features a non-moving intake, and wide span wings with accentuated tip extensions. 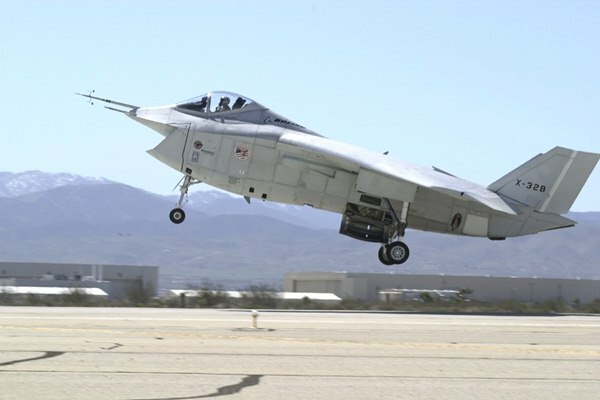 The X-32B features a moving intake cowl which translates forward during hover to allow more air into the engine. The fuselage is slightly shorter and the wing span has been narrowed to reduced weight. No wing leading edge lift devices are fitted. The twin lift nozzles are concealed behind doors in the fuselage belly when not in use. Since the X-32 design was frozen, continued design evolution has resulted in the planned production version (model 375) gaining a conventional tailplane, to enhance manoeuvrability during approach to an aircraft carrier, and hence a stubby swept wing has been adopted rather than the original delta wing. The engine intake cowl will now be raked forward rather than backwards. Boeing anticipates that all three production versions will have the same length fuselage. The production version is known in the programme as the Preferred Weapons System Concept (PWSC). The Lockheed Martin X-35 was selected as the winning JSF design on 26 October 2001. Some X-35 workshare may be awarded to Boeing as a consolation. X-32A CTOL concept demonstrator for the USAF and US Navy. X-32B STOVL concept demonstrator for the USMC and Royal Navy. Model 375 Boeing designation for PWSC production version. CTOL PWSC Baseline production version, for USAF. STOVL PWSC USMC production version with shortened wings, under-fuselage lift nozzles and moving intake cowl. CV PWSC US Navy production version, featuring additional outboard wing ailerons and strengthened landing gear. 1990 Common Affordable Lighweight Fighter (CALF) study launched by Defense Advanced Research Project Agency (DARPA). 1993 Boeing joins study programme. August 1994 United Kingdom joins study programme. 1995 CALF incorporated into JAST (Joint Advanced Strike Technology) concept studies. March 1996 Request for proposals issued to Boeing, Lockheed Martin and McDonnell Douglas led teams. mid 1996 JAST programme renamed JSF (Joint Strike Fighter). 16 November 1996 McDonnell Douglas eliminated from competition. Boeing and Lockheed Martin awarded contracts to produce and flight test 2 technology demonstrators each. late 1996 McDonnell Douglas joins Boeing team. 18 September 2000 Maiden flight of X-32A CTOL demonstrator. 21 December 2000 First supersonic flight by X-32A. February 2001 Final production PWSC design submitted. 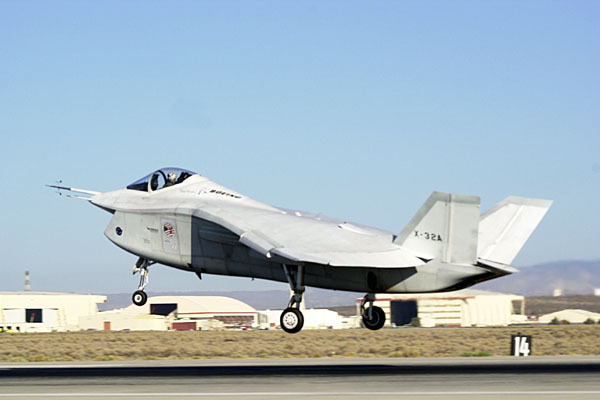 7 March 2001 First hover of X-32B STOVL demonstrator. 13 April 2001 First airborne transition from conventional to STOVL mode and back again by X-32B. 28 July 2001 Short take-off, supersonic flight and slow STOVL landing in one mission achieved by X-32B. 26 October 2001 Lockheed Martin X-35 wins the JSF competition. Dimensions: Length 45 ft 0 in (13.72 m) for X-32A, 43 ft 8.6 in (13.33 m) for X-32B; Height 13 ft 4 in (4.06 m); Wing Span 36 ft 0 in (10.97 m) for X-32A, 30 ft 0 in (9.14 m) for X-32B; Wing Area 590.00 sq ft (54.81 sq m) for X-32A. Engines: One Pratt & Whitney F119-PW turbofan derivative, designated SE614, rated at 42,000 lb st (186.9 kN) with afterburning and 34,000+ lb st (151.3 kN) without afterburning. (F119-PW-614C for CV/CTOL and F119-PW-614S for STOVL variant). Weights: Empty Equipped 22,046 lb (10,000 kg) for USAF CTOL and STOVL, 24,030 lb (10,900 kg) for CV/CTOL; Normal Take-off 38,000 lb (17,236 kg) for USAF CTOL; Maximum Take-off 50,000 lb (22,680 kg) for all variants. Armament: Six AIM-120C AMRAAM or two AIM-120C AMRAAM and two 2,000 lb. JDAM in internal fusleage bay; provision for one 20mm M61A2 rotary cannon with 400 rounds in starboard wing root (USAF CTOL variant). Provision for 4 underwing pylons with 5,000 lb (2,268 kg) capacity each. * Former Rockwell facility. Forward fuselage and cockpit designed and produced at the Phantom Works, St Louis. * Includes ‘Focus Aircraft’ feature on the two JSF contenders. * Includes feature article on JSF flight testing.